1st Wave. This wave would be organized with l8-24 assault climbers (depending on size of unit), Plt / unit commanders and cliff head security (top and bottom). NOTE: Additionally within the first wave, a company-sized unit may want to designate a vertical hauling line/suspension traverse team to establish these installations on top for heavy equipment. ¡9 2nd Wave. This would constitute the remainder of the task-organized units, the assault force and the reserves. The XO is delegated in command of the second wave and will stay at the base of the vertical obstacle until the unit has negotiated the vertical face. ^^The amount of time the unit is stationary at the vertical obstacle should be minimized. Ideally, the main second wave should move from the boat/landing craft or rally point straight into the climbing lanes (via beach master). TRANSITION: Now that we have discussed the organization of a cliff assault, are there any questions? Let's look at some different techniques that may be used to move personnel and gear up the face of the vertical obstacle. a. Two party climb for assault climbers, all other personnel top rope. b Two party climb for assault climbers, all other personnel go up fixed rope installations. 9 Two party climb for assault climbers, all other personnel/equipment utilize vertical hauling line and/or suspension traverse. d Two party climb for assault climbers, all other personnel utilize cable ladders. TRANSITION: Are there any questions over the techniques? Now let's look at the sequence of events to be followed by each wave. Remember this is only a technique, not a principle; but it is a tested technique, and experience has shown the value of a set sequence to be followed when entering enemy territory, especially at night. Q0. (25 Min) ASSAULT SEQUENCE. The Assault Sequence can best be understood and organized if it is broken down into five phases, with many actions and tasks taking place simultaneously within each phase. a. Phase One. The first wave arrives at the cliff base. 7irst wave moves into ORP. JCHO and leaders conduct recon of proposed climbs and establishes left and right lateral limits. Easiest climbing routes are selected for leaders. ^The #2s prepare gear for climbing. Echo and BM place flank securities into position. ^Climbing teams move to designated lanes and prepare to climb. W)At least one climbing team must have a radio. L^rtjAll lead climbers should have NVGs, but not climb with them on. MSflAll lead climbers should climb with minimal gear. ^JjOne or all of the lead climbers will carry a static rope. These are to be used for the rope installations. KflHardest climbs go to the best teams. Casevac plan is formulated and litters prepared. The area that the climbers ascend is not necessary the area where climbing lanes are established. First wave must be ready to move if this is the case. b Phase Two. Begins as soon as first lead climber begins to climb. ¡Communication must be established between the top and bottom of the cliff. If possible the CAC should be one of the leaders and have a radio. mergency rappel lanes are established to provide for a quick withdrawal if the mission is compromised, a 4:1 ratio is required. These are usually single rope rappels. jThe remainder of the first wave needed on top (CHO, CPNCO, security, etc...) begins to ascend as soon a climbing lane is established. All lanes must be cleared "hot" by the CHO before they are climbed by the second wave. Security is positioned by the CHO. CHO needs to ascend ASAP to make final decisions on location of vertical hauling lines (VHL), security, control features, etc. Assault climbers on security are relieved by designated security teams. Once on top, the Raid Force Commander (RFC) departs for the leader recon. begun to construct lanes. The BM position will be dependent on the vegetation/terrain. Gear is prepared in ORP for hauling systems. 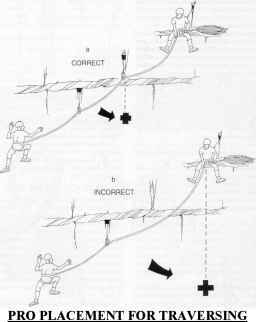 Vertical hauling lines and/or suspension traverse is constructed. At least one assault climber must be left on the deck to aid in the construction/operation of the VHL. ane NCOs move gear needed on top to VHL and it is taken up to cliff head. ^Control Point NCO establishes topside control features. Ba landline between the BM and the CPNCO is established. J#2 climbers climb the ladders to check for the need of intermediate anchors. JOnce all of first wave is on top, Casevac Plan must be formulated to lower casualties, if necessary. JORP may be moved closer to cliff base for better silence/security. 9 Phase Three. Arrival of the second wave for their ascent of the cliff. ^^Company should establish radio contact 10 minutes out. ^^Second wave establishes an ORP, preps to climb and XO makes liaison with the BM. ^^Company should already be broken down into climbing sticks for easier control. Each Marine is assigned an alphanumeric indicator within his element. ane NCOs are stationed at the bottom of the lanes to assist Marines. arines check in with BM and give their stick number. BM does final check for proper knots/equipment. The BM will then direct the Marines to specific climbing lanes. Mm arines with heavy loads or crew served weapons are directed to the VHL. These climbers are then directed to the climbing lanes closest to the VHL for easier recovery of their gear once on top. ^^Once on top, all Marines follow control features to the CPNCO, and give their stick number to him. The CPNCO will then direct the Marines to their new position. aid force begins to establish a 180-degree defensive perimeter and awaits return of the RFC. An option of staggering the raid force by element within the control feature is possible. Once all members of the second wave are on top, the XO ascends the cliff. In the event that there are missing personnel at the top, stick numbers can be checked to ensure that a Marine(s) came through the BM and the CPNCO, and that no one is still within the confines of the control features or the ORP. BUpon return of the RFC, he issues final orders and briefs possible shifts in his time lines, the raid force then moves out to its objective. ^If the raid force is not withdrawing via the cliff, the first wave joins the second wave at the top of the cliff and continues on with the raid force. Options to the RFC are to either wait on the first wave to join the second wave and move out, or move without first wave and linkup at a later time. d Phase Four. Departure of the Raid Force. NOTE: The time hack is used for withdrawal if the mission is cancelled/compromised. W)The control features, top and bottom, are removed to prevent detection. )All unnecessary equipment/personnel are moved to the cliff base. ¡Assault climbers begin to take down climbing lanes and establish retrievable rappel lanes. Belay men must be stationed at the cliff base for the second wave. |The VHL/ suspension traverse is left in place. The systems may be slacked or AFrame collapsed to prevent detection. ¡A central point for casualties and EPWs is established and litters are prepared for possible medical evacuations. )Personnel topside form ORP and await arrival of the raid force. ersonnel at the cliff base do likewise. Echo follows progress of raid force on radio and stays aware of situation (casualties, EPWs, changes in plan etc.). NOTE: If the unit is compromised before the mission has been completed, then the tactical situation will dictate how the withdrawal will be accomplished. ¡Control features are re-established at the top and bottom. Laid force re-establishes 180-degree defensive perimeter. Any casualties are moved to the cliff head and evacuated. b^^Once the order to withdrawal is given, the BM prepares to receive the descending Marines. In an amphibious operation, he would call the landing craft/boats at this time. ^Company XO is among the first to rappel down. ^A high concentration of automatic weapons and unit leaders are left on top. )Squads thin their positions with the squad leader descending last. He reports his squad departure to the CPNCO. )The unit commander descends after the main body departed. JOnce the entire second wave is down, the bulk of the first wave begins to withdrawal. ^Assault climbers begin to tear down the rappel lanes and VHLs/suspension traverses. All ropes are dropped to the base of the cliff and back stacked into rope bags. A-frame poles are lowered. CHO is constantly aware of the state of the cliff head. CPNCO and BM tear down their control features. ¡Security comes in and descends the cliff via the retrievable rappel lanes. Assault climbers descend with the CAC and CHO being the last men down. mMThe retrievable rappel ropes are retrieved. Assault climbers account for all gear and personnel. ^^Assault climbers check in with the BM and all rejoin the unit. TRANSITION: Now that we have discussed the five phases, are there any questions? Let us talk about some general considerations.